The volume: Jurors heard from 57 witnesses and saw hundreds of exhibits, per Vice. Now they have a 25-page charging document to assess and what amounts to a complicated eight-page "scorecard" to fill out with the verdict on each count and related violation. To help, they have about 60 pages of instructions. Quite a count: El Chapo is charged with 10 different counts, but those counts are doozies. For example, the first one, "Engaging in a Continuing Criminal Enterprise," has 27 separate violations, and all must be considered individually, reports the New York Post. To be guilty of the count, he must be found guilty of at least three of the violations. Sample questions: The jurors have returned to the courtroom with questions, including, "Is ephedrine considered methamphetamine?" "Does a violation have to be proven or not proven unanimously?" and is it a "drug crime" if cartels kill rivals for "personal reasons"? They've also requested thousands of pages of testimony from witnesses. Witch hunt. What about Hillary's emails. Indict Comey! Any truth to the rumor #45 is thinking of nominating him to run the DEA? 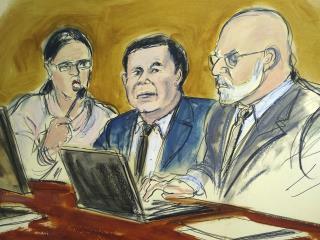 Is the woman in the courtroom drawing eating or singing into a microphone?